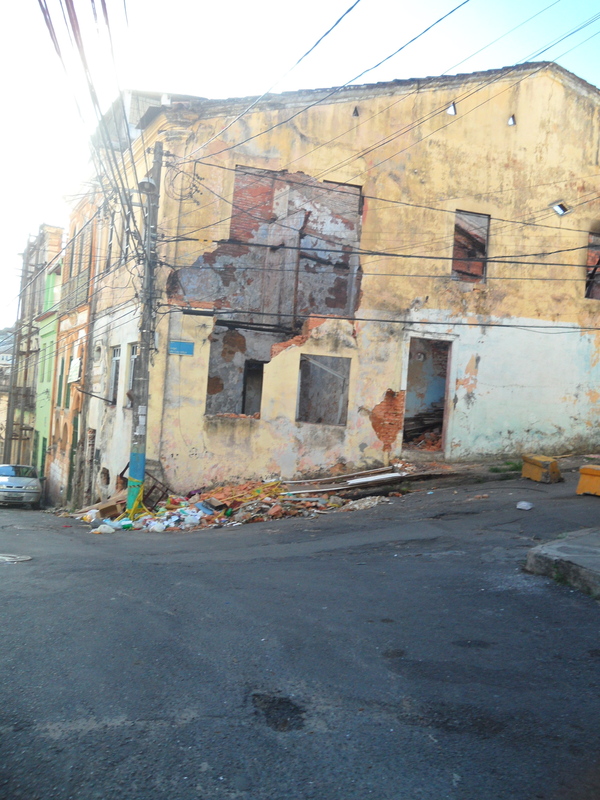 Our first day in Salvador was the exact opposite to what I had imagined. First of all, our bus was on time; actually, it was 3 and a half minutes early; neither of us could believe it. By the time we figured out the bus system, it was after 6pm and we were in full-fledged Carnaval traffic. 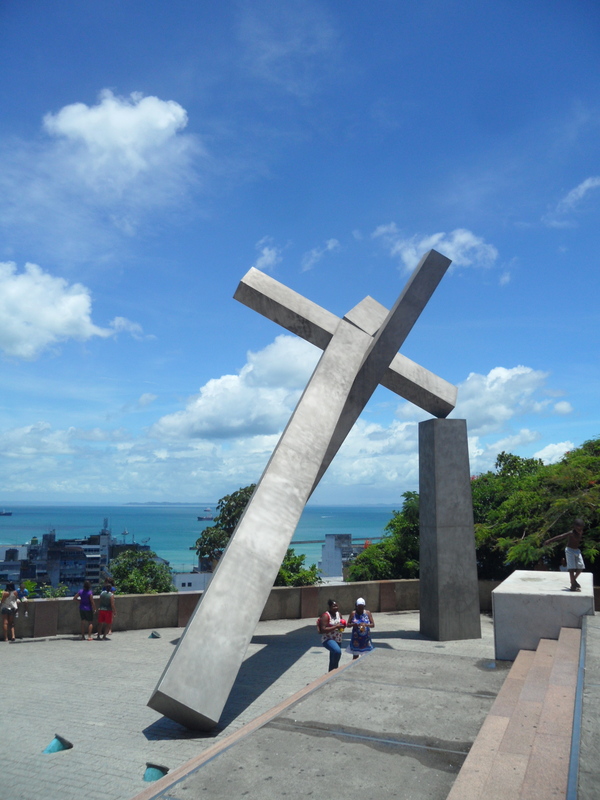 An hour and a half later – with the help of a woman who literally chased down the bus when we missed our stop and told the driver that “the stupid gringos didn’t know where to get off” – we made it to the edge of the Pelorinho. As we stepped off the bus, we were faced with was a giant outdoor elevator that rose above the city. The woman motioned for us to get on. We were unsure what was happening, but had little other ideas of our own, so we followed her lead. Up we went, about 30 stories above ground, and the doors opened out, miraculously, onto the Centro. It was madness. People were everywhere! Dressed up in strange costumes, men in drag, people selling beers, necklaces, street food, you name it. The noise was insane, drums and samba music blared through the streets; the place was lively and fun and people of all ages danced uninhibitedly through the crowds. This was the Placa de Se: a large plaza in the Pelo district that the buses no longer run to because of Carnaval. Our directions to the hostel were simple: “bus to the Placa de Se, then from there take a taxi to the hostel”. The problem was, the entire Pelo district was closed to vehicles for the parade. Additionally, the Lonely Planet map ONLY showed the Pelo, and our hostel was off the map by just a few blocks. What I remember from looking at the map when I booked in OCTOBER (5 months earlier) was that we were North. That is all: just North. So we headed in that direction, backpacks and all, through the throngs of people. We stopped at a random hotel to see if they knew directions. They had never heard of it, tried calling with no answer, but let us use the wifi so I could track where we were on my IPod. According to my GPS, we were 6 blocks from the hostel; so we began walking. We walked to the edge of the Pelo and all the crowds stopped. We were only 3 blocks away and found ourselves standing at the foot of a hill, with a military police station across the street, staring up into the alleyway of a favela. There were no lights and no cars, just some shady looking characters sitting in the shadows drinking and smoking. We both looked at each other and shook our heads. Nope, not walking up there. Luckily, a cab drove by and we hailed it down. We passed him the address and he shook his head. So I showed him on my GPS where it was. He pointed up the hill and we nodded. “No. Walk, or find another taxi” and he kicked us out. So there we were, just standing there with all our backpacker getup and not knowing what to do. For those of you that haven’t been watching the news in Salvador, you should note that 2/3 of the police force has been on strike since January 31st. By February 10th, only 11 days later, there were already over 150 murders in the city of Salvador alone. The police never came back for Carnaval; however, the government did bring in the military to oversee events, and their presence was everywhere along parade routes. Not that ANY of these murders were random acts of violence on tourists, but these current events were in the back of our minds while we were standing there. After much debate, and seeing no other route on the map, we decided to chance the walk. 3 blocks. That’s all we had to go. Before we even made it a block an a half a young man was calling at us. “We already have a pousada,” I explain, “and it’s up here!” Adam handed him the address; he looked at it strangely. Ahh yes, they know it. So the first guy motions for us to follow him and Bob. “I’ll show you there” he says. “I’m Anton, This is Bob. You know, like Bob Marley?” They both giggle, and Bob kind of does look like a young Bob Marley but with shorter hair. The two guys are probably in their mid to late 20s, with jet black skin and glowing white smiles. Anton is tall and slender, Bob is about 5’8″ and has a stockier frame. Anyways, sure enough, 3 blocks later we are led right to our hostel! Thank God! We thank the guys, and head to reception. We are shown our room, and ask where we can get some dinner. The receptionist points down the street, then leaves. So after washing up, we head out in search of food. Not two blocks down the road we hear “Amigos!” It’s Anton. He is body painting some local women for Carnaval (which we later find out is his job). He introduces us to the owner of the cafe he is at, who goes out of his way to make us whatever food he can find. Anton joins us for a bit and asks us if we are going dancing in the parade tonight. We say yes and he offers to take us down to the Pelo. 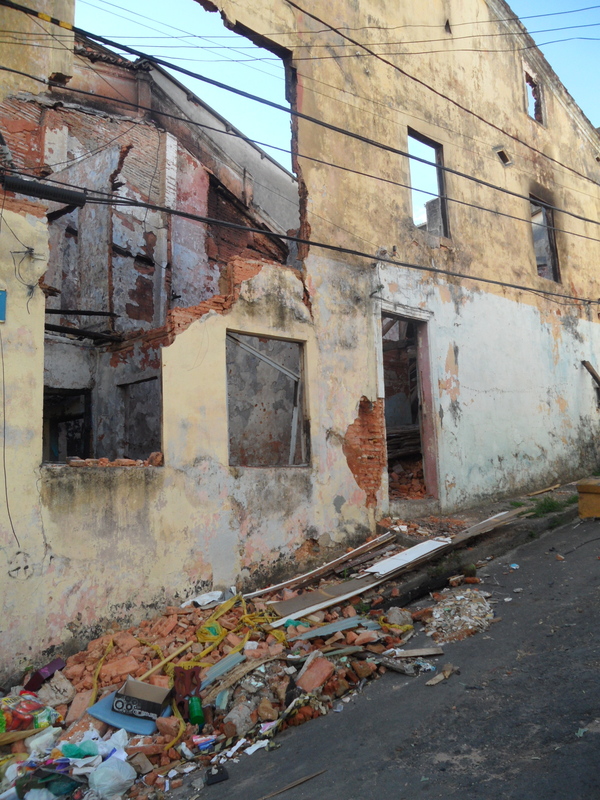 So after dinner, he and Bob take us back through the favela. On the way down they explain some of the “history”. “You see this house?” we looked up at a dilapidated and gutted old concrete building with a 7ft hole in the side of it. “That was a drug house. You know, crack, cocaine, crystal meth? Ya, it exploded just a couple months ago.” Hmmm, safe neighborhood. Then we all stopped at Anton’s house. It was a single room with a bed, a tv, and a makeshift kitchen. He introduced us to his mother, his neighbour and even his little puppy dog. From that point on, we were introduced to nearly EVERY person in the favela. Shop owners, people walking down the street, friends of theirs hanging out on the side of the road. “These are my amigos from Canada!” everyone was incredibly friendly and interested in us. We smiled, shook hands, “nice to meet yous” all around. They would chime in with the occasional English word and look pretty proud that they got to use it. Anton explained that favelas were dangerous places for outsiders. At any time, someone could easily rob us, or pull a gun on us; however, the favela works as a community. Everyone knows everyone else’s families and friends, and they look out for each other. Anton had lived in the favela since he was a little boy, people knew and trusted him. Because he had just introduced us to everyone as his friends, we were now part of the community, and no one would harm us: and we found, for the next three days, that we were met with many smiles and “Bom Dia’s” from the people. 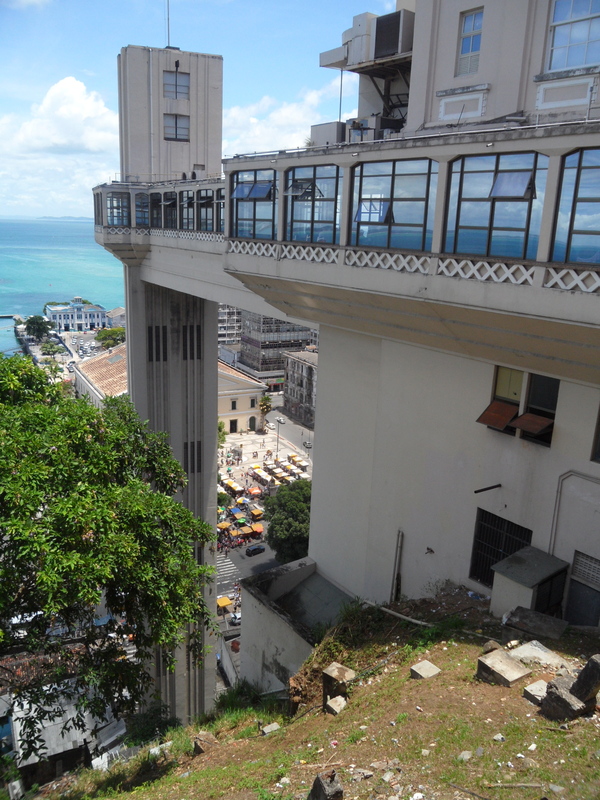 So Anton and Bob took us down to the Pelo and began to give us the most amazing tour of Salvador. We met all the shop owners and artists, and saw beautiful old churches on off-beaten tracks. They explained the history while I translated as best I could to Adam. Occasionally they would ask what the English translation for a word was and it usually ended in laughter at how crazy the word sounded in our language: “eat,” “cheers,” “walk” and “thief” were not only particularly hard to pronounce, but also giggle worthy in their minds. Anton explained how the Pelo district is the historical center where slave ships from Africa first stopped. 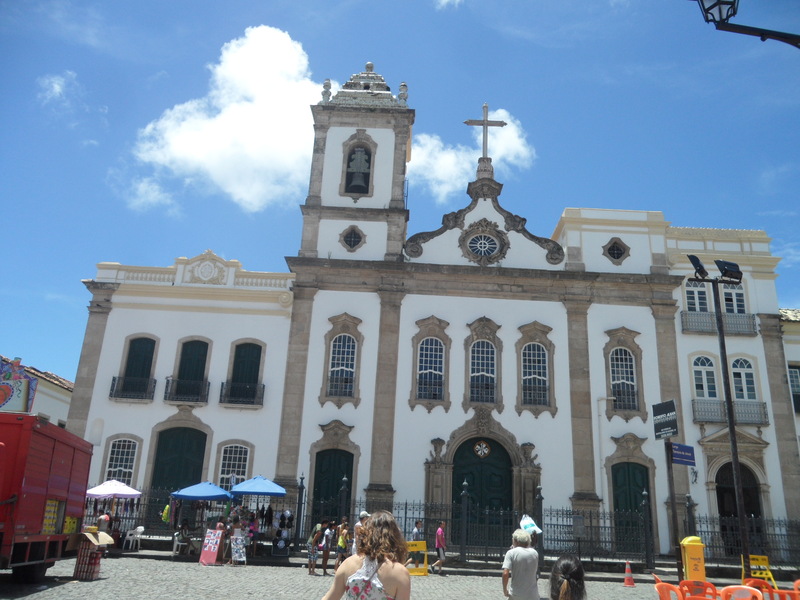 Right in the middle of the Placa de Se, where people danced and sang for Carnaval, was where church officials ordered hundreds of black slaves hung, or their heads stomped to death on the sidewalk. They pointed out the traditional African garb that still influences Bahian dress, and how the drum beats in the parade music differ from the South of Brazil. Salvador, and the whole Bahian province, is clearly defined by its African heritage: dark skin, varied music, dress, spices in food, culture, everything. During the tour they asked if we liked Reggae music. We both nodded and were led down a back street towards a bar. The scene was straight out of a movie. The doorman shook hands with bob and Anton who signaled that we were with them: and we all walked in. The bar was full of black-skinned Rastafarians, fully stereotyped with the long dreads; the colourful knit hats and the Bob Marley-esque tie-dye clothing. The place reeked of pot and people were doing lines of cocaine right off the tables. Slow reggae music pulsed in the background and EVERYONE stopped what they were doing to look at Adam and I: probably the only white-skinned, blue-eyed people to ever step foot through the front doors. Anton pushed us through the crowd and introduced us to the owner. He asked him to watch out for us if we ever came in here again without him. The owner nodded and then Anton turned to us and in a very strict voice said “Don’t you EVER come back in this place alone! It’s dangerous!” and with that he dragged us right back out of the bar. Which we were more than happy about, feeling just a little out of place in there. “Okay, should we dance?” Anton asked. So after grabbing a drink at his cousin’s kiosk and stopping to body paint his two little nieces, we trekked to the parade route. I’m not exaggerating when I say there were probably a million people dancing in the street that night. Music blared, people danced and sang along to songs I’d never heard of before as their favourite bands moved slowly along in large floats. Sorry, I’m not going to fully describe the parade until we get to the next day’s events. We did follow some trucks for a while, pushed through the hoards of people, nearly got tear gassed trying to get through an alley and eventually walked home. By 3AM my head was spinning with English, Portuguese and Spanish all at once. I could no longer understand simple phrases and was incapable of translating to Adam anymore. We’d been up for 21 hours on little sleep, and the craziness of the unexpected night was overwhelming. We called it a night early, according to Carnaval standards, and went to bed. This entry was posted in Brazil, South America and tagged Brazil, Carnaval, Carnival, Favela, Parade, Party, salvador, South America, Travel, World's Largest Street Party by hilarylust. Bookmark the permalink.